The burgeoning choice of children’s apps available to download can feel a little bewildering. So how can you tell if an app or a game that tries to be educational, really does have some educational potential? The App market offers parents and children a wide range of apps and games to choose from. Many apps for young children are labelled as ‘educational’ but so far there has been no research that could determine whether they are actually effective in teaching children. Parents have little time to scope advice on what to buy or download from the internet. Unfortunately, there is minimal professional guidance about what is educational and what is not. In our study carried out in the Cognitive Development lab at the University of Salford we are exploring how children aged 2 – 4 years learn language from educational touchscreen apps. 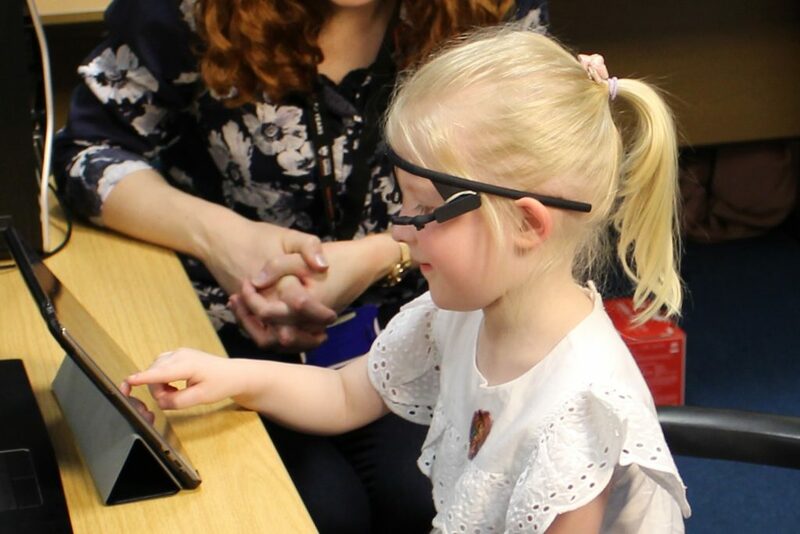 We ask children to wear special glasses tracking their eye movement and we are looking at children’s attention during tablet use – what are they focusing at on the screen when they are using an app on the tablet and what can it tell us about their word learning. Our research will help to identify whether touchscreen apps can benefit children’s learning. We want to help parents make better choices for their children’s use of digital media. Our 3-years research project is funded by the Economic and Social Research Council (ESRC). A visit in our lab is fun! We invite parents and children to visit us in our lab and to take part in our fun games. 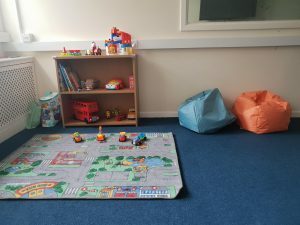 Our lab is a colourful child-friendly room full of toys with some space for parents to enjoy a cup of tea or coffee while we tell them about the study. During a visit to our lab, children play on our specially designed word learning app and do some fun language based activities with us. The study takes approximately 45 minutes together with short breaks between the activities. Children who have visited us so far had lots of fun with our games! RESEARCHERS are calling on nurseries and parents of young children to take part in a large study investigating the effectiveness of children’s educational apps. 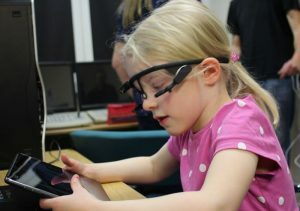 Academics from the University of Salford and Lancaster University will spend three years using eye tracking glasses to find out whether the apps, which claim to help young children learn new words, have any effect on language development. Dr Gemma Taylor, a developmental psychologist from the University of Salford, who is leading the project, said: “We live in a digital age and children are exposed to screens from very early on in life. With apps playing an increasingly prominent role in young people’s early environment, it’s vital we know how effective they really are. The £234,000 study, funded by the Economic Social Research Council (ESRC), will see researchers go to nurseries across the North West to see how 2-4-year-olds interact with a specially developed experimental app. 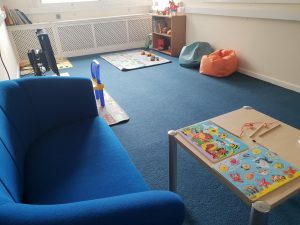 Parents who want their children to take part will also be able to come to a lab in the University of Salford’s Allerton Building designed to look like a nursery. Children will wear special glasses that track their eye movements, to see which parts of the screen they look at when using the app. Following the sessions, the children will be shown a series of ‘novel’ words, which don’t exist in the English language and which they will not have come across before, to see whether using the app has any impact on their ability to learn new words. Researchers hope to have studied more than 250 children by the end of the study, as well as carrying out a full review of the educational children’s apps currently available on the market. The eye tracking glasses will help us find out whether children are looking at what the developer wants them to look at – or whether they’re distracted by the pretty butterflies in the corner of the screen. Dr Taylor said: “We want to find out what elements of apps help children interact with and learn from them, so we can direct app developers and parents towards them. We’ve been working on our lab space in the Allerton building at the University of Salford for a while now and we wanted to share a couple of photos to show off our child friendly lab space. We have a play area for children to relax and warm up before we start running our studies. 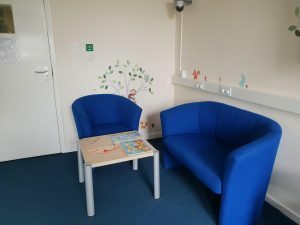 We have a space for parents to enjoy a cup of tea or coffee (in a spill proof cup) in the same room while we explain the study and answer any questions. We then have a space in the same room to run our studies while parents sit back and watch. In our studies, parents remain with their children at all times. Our main priority is to make sure that participating in our studies is enjoyable for both parents and children. We hope you’ll visit the lab soon to take part in one of our studies for children aged 2-4 years. It is an honour to have been chosen to be a recipient of the BPS Research Assistantship scheme and I am excited to be part of this project with Dr Gemma Taylor. I will be working on a project titled: “Investigating the role of children’s visual attention on the video deficit effect” during the summer with 2-1/2-year olds to 3-year old. Please get in touch if you’d like to take part! 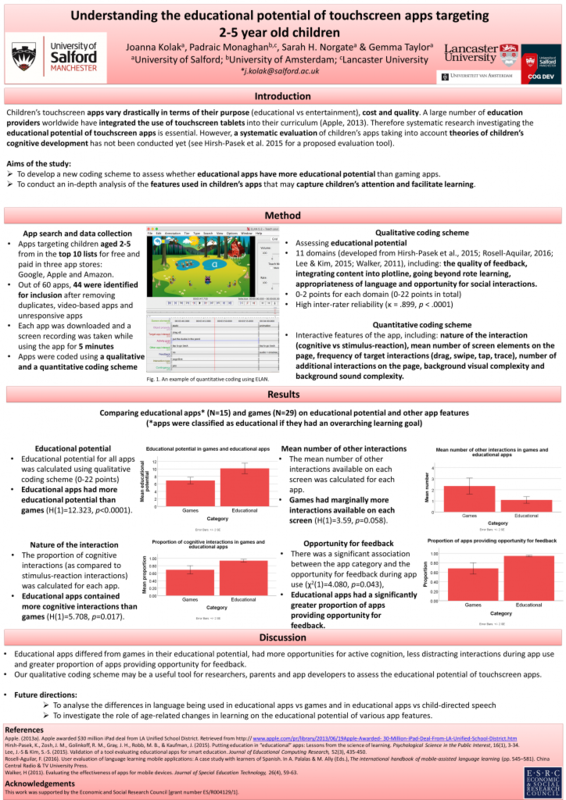 As part of the BPS Research Assistantship scheme we will be running a study examining the role that attention plays in learning from 2D screens (e.g., television) and learning from real world 3D interactions. Previous research has suggested that children up to 3 years of age are not able to transfer knowledge from 2D to 3D and vice versa very easily (this is known as the video deficit effect). We aim to examine the role attention has to play during learning when transferring knowledge from 2D to 3D. 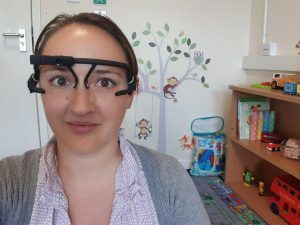 With the aid of my supervisor, Dr Gemma Taylor, we will use eye tracking glasses to examine where children are looking when watching an imitation demonstration either live or on television. We hypothesise that children’s attention during learning will be related to their learning and their ability to transfer what they have learnt from 2D to 3D. It’s really important to investigate how children learn from digital screens because children are growing up in a digital age surrounded by digital media. It is estimated that nearly 96% of three to four year olds watch a television for 15 hours or more a week, and nearly half (41%) watch TV programs on tablets and other devices as well as regular television viewing (Ofcom, 2016). I will be presenting my findings at the BPS 2019 Annual Conference and I look forward to the opportunities that the studentship will present me with on my career path to become a Developmental researcher. I received my MA in Psychology from Jagiellonian University (full 5-years programme) in 2013. In my thesis, I focused on attention functioning in Polish-English bilingual children living in the UK. Two years later I completed a BA in Portuguese language from the same university. In my BA project, I was interested in language switching in Portuguese speakers living in the UK. Since then I have worked as a project coordinator and/or research assistant on several projects, investigating language and cognitive development in bilingual children, their narrative and phonological skills as well as functioning of memory and attention in teenage bilinguals. I have cooperated with different universities – Jagiellonian University, University of Warsaw, City, University of London and University of Reading. 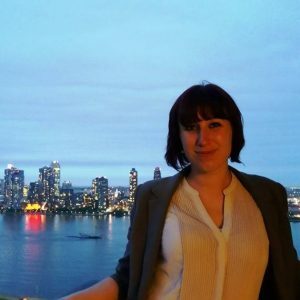 In my most recent position, at the ESRC International Centre for Language and Communicative Development (LuCiD) at University of Manchester, I have worked as a researcher on a project investigating how Polish, Finnish and Estonian children learn to use and understand nouns and verbs correctly. Contrary to English, in which nouns can have only one possible ending added to them (–s, to indicate plural nouns, e.g. table-tables), each noun in Polish, Finnish and Estonian can have many different endings that can be attach to it, depending on the context in which a speaker wants to use a given noun (for example ‘table’ in Polish would have a different ending attached to it in each of these contexts: “There is a cup on the table”, “Look at the table!”, “There is no table here”, etc.). Because of the complexity of noun and verb systems in Polish, Finnish and Estonian, our research team was interested in how children are able to learn so many different rules and endings and become fluent speakers. As part of my experience as a researcher on various projects, I have recruited and tested children aged 3 to 8 and teenagers, and tested them with language, memory and attention tasks; I have also designed experiments in forms of games, which measured children’s language learning. I have always enjoyed public engagement activities supporting the impact agenda for the projects I have worked on – especially running workshops on language development for parents and practitioners. I am currently finishing my PhD at the Department of Psychology, University of Warsaw. In my research, I am interested in the role of internal and external factors in fostering balanced language development in bilingual children. I am very excited about starting a new research chapter in my career and being part of the ESRC funded project “Investigating the educational potential of touchscreen apps for children’s early vocabulary acquisition” with Dr Gemma Taylor (University of Salford) and Professor Padraic Monaghan (Lancaster University). I am thrilled about the strong societal impact of the project; I believe that clear scientific evidence and guidelines for children’s educational apps use would provide invaluable knowledge for parents, early years practitioners and app developers. I’m a 1st y ear Psychology and Counselling student at the University of Salford. I’m the middle child of five, when I was growing up my mum was a childminder and I loved helping her with the children she looked after. I have always wanted to work with children and once I finished high school I went to college to complete a diploma in childcare and education. After college I worked as a qualified early years educator for 13 years, working with children under the age of 5. While working in nurseries I took on different roles, first senior, then Every Child a Talker (ECAT) champion, and finally Special Educational Needs Co-ordinator (SENCO). During my ECAT training I heard about ‘The 30-million-word gap’ a difference in the words spoken by children from the wealthiest and poorest families by the age of three. “Simply in words heard, the average child on welfare was having half as much experience per hour (616 words per hour) as the average working-class child (1,251 words per hour) and less than one-third that of the average child in a professional family (2,153 words per hour)” (Hart & Risley, 2003, p.8). This caught my attention and made me want to find new ways of helping children to learn. This, as well as my love for helping children with special educational needs, made me decide that I would need to further my education at university. Becoming a Research Assistant working with Dr Gemma Taylor was very exciting for me, especially knowing the first study I’ll be working on with her is investigating ‘The role of digital reinforcement’. The ages that children are using different types of media are getting younger. The Early Years Foundation Stage (EYFS) even states that children should know that information can be retrieved from computers by 30-50 months. I find this so interesting and often wonder how it will impact on their overall development. As a Research Assistant I will be working closely with parents, nurseries, and children helping collect data and coding it. Hart, B., & Risley, T. R. (2003). The early catastrophe: The 30 million word gap by age 3. American educator, 27(1), 4-9. I’m Eve and I am a research assistant for Dr Gemma Taylor in the Salford Cognitive Development Lab. 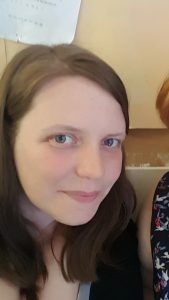 I am a 2nd year Undergraduate full honours Psychology student at the University of Salford and a mother of four children aged 4, 6, 9 & 11 years. In my role as a Research Assistant in the Salford Cognitive Development Lab, I have a range of responsibilities. I work with Dr Taylor to develop the videos and toys that we use in our studies. I also communicate with parents and nurseries to explain our studies and run the studies with young children. We always make sure that everyone enjoys taking part in the studies. I am fascinated by the current research in the lab examining the role of digital media on children’s development. 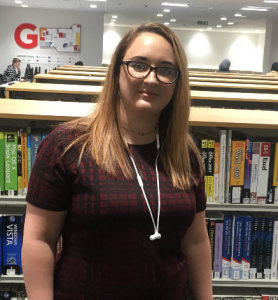 As a mature student, I have worked with children for many years across my career and have previously undertaken a Foundation degree in children’s learning and development. It was from this work with children that my interest in Developmental Psychology was sparked. It fascinates me why children do things, how they learn the skills they have so quickly and how they interact with the world around them. One of my areas of interest specifically is how children are developing in this ever-changing world of digital technology. Modern children have more access to the digital world than ever before. Although children’s digital media use is often portrayed negatively in the media, there may be a multitude of benefits that we have yet to discover. This is where my role within the Cognitive Development Lab begins to align with my interest in children’s development. My experience as an undergraduate research assistant so far has already given me a great insight into what my career could be if I continue to aim down the path of a Developmental Psychology Researcher.